Most of us have heard the terms “Free Range, Pasturized, Cage Free, Organic, and Natural”. We, as consumers must be careful when using these terms for evaluation. Although buying USDA organic gives assurance that the chickens are not being fed GMOs, a lot of the time, the terms above can be somewhat misleading and confusing. As you can see in the above photo, the organic egg in the middle looks just as pale as the conventional egg. This is definitely a major difference in quality! So, if the labels on the carton are not sufficient for us to make a well informed choice, how do we know which eggs to buy? but my husband used to buy eggs from Glaum Egg Ranch. However, when I looked up the company on the score card, I was surprised to find that they did not score well at all. Even though they are certified USDA organic, cage free and certified humane, they received one of the worst ratings! So, I called and emailed Glaum Egg Ranch, and asked them if I could tour their facilities. I did not receive any response to my emails or phone calls. Trying to find information, I went on yelp and found out that there were other people trying to get a chance to visit their facilities but none of them were able to. The owner responded to comments stating that since his company participates in third party certification with regular inspections, he doesn’t need to make his facilities accessible to the public. Really? Well, I don’t want to purchase from a company that I am not allowed to visit. So, we stopped buying Glaum Ranch Eggs. 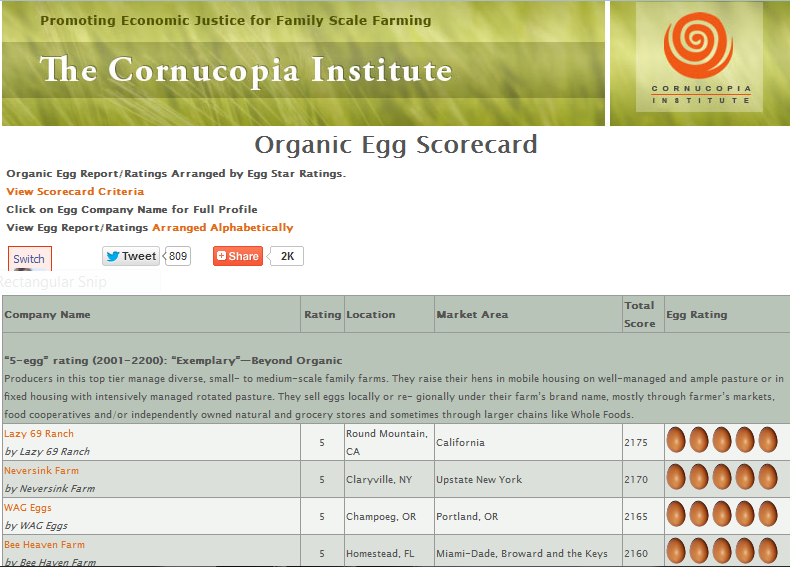 I went to our local natural food store the next day and brought my Cornucopia Egg Score Card. Most of the brands at our store did not score well, but then I found Organic Pastures which had one of the best scores. So, I purchased it. I was so glad I did because the difference in egg quality was absolutely profound. The Glaum Eggs were pale, tasteless, and broke so easily, while the Organic Pasture eggs were dark, rich yellow, flavorful and almost impossible to break. This experience was a real eye opener for me. Certified Organic: The birds are uncaged inside barns or warehouses, and are required to have outdoor access, but the amount, duration, and quality of outdoor access is undefined. They are fed an organic, all-vegetarian diet free of antibiotics and pesticides, as required by the U.S. Department of Agriculture’s National Organic Program. Beak cutting and forced molting through starvation are permitted. Compliance is verified through third-party auditing. Certified Humane: The birds are uncaged inside barns or warehouses but may be kept indoors at all times. They must be able to perform natural behaviors such as nesting, perching, and dust bathing. There are requirements for stocking density and number of perches and nesting boxes. Forced molting through starvation is prohibited, but beak cutting is allowed. Compliance is verified through third-party auditing. Certified Humane is a program of Humane Farm Animal Care. Posted by simplycookingrealfood on February 12, 2013 in Choosing Ingredients. Very eye-opening and helpful, thank you!